Thank you to the 600+ teams who participated in last year’s Orange County Kickoff Classic. We had teams from Colorado, Washington, Arizona, Nevada, Northern California, Southern California, Utah, Mexico and Canada who competed in the last year’s OCKC soccer tournament. The OCKC focuses on giving your team the very Best Value for your tournament dollars. In addition, Balanced Brackets, Pristine Fields, Great hotel selection, Cooler Climate, Clean Restrooms, Well Stocked Concessions, and an Exceptional Soccer Experience. The Irvine hotels have been updated on the Orange County Kickoff Classic web site and the Irvine hotels are ready to assist your travel needs. We look forward to seeing all of you at the 18th Annual OCKC. 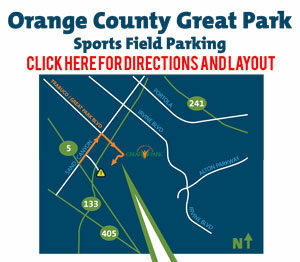 The 2019 OCKC is continuing its expansion by adding additional high quality soccer fields at the Orange County Great Park in Irvine, CA. To help you plan: Out of State teams are Guaranteed Entry. Find a place to stay in while here for the tournament. Compilation of soccer field directions and maps.